Incontinence diapers are what the medical industry calls diapers for adults. You can call them incontinence briefs if you wish, but for all intensive purposes, adult incontinence diapers and briefs are pretty much the same thing. As far as protection is concerned, adult diapers are the most versatile depending on the products. With a wide variety to choose from, there are adult diapers made specifically for overnight protection as well as diapers made for during the daytime. In general, diapers made for overnight protection provides maximum protection but may be bulkier. 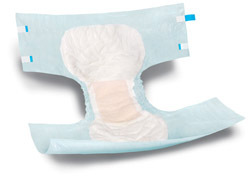 Incontinence diapers made for during the daytime are generally thinner to make walking while wearing more comfortable. Adult diapers are best used for moderate to heavy symptoms including incontinence of the bowel. The first thing you will want to look for is the absorption ability of the adult diaper you are considering. This is to ensure you are always comfortable and your skin remains healthy. The next key feature we recommend you look for is the breathability of the adult diapers being considered. Good airflow helps prevent or minimize skin irritation that may occur. Adult Incontinence Diapers Copyright © 2007 by DiaperIncontinence.com. All rights reserved.